It wasn’t because of the picture quality I was starting to get unhappy with my older digital camera. It is an Olympus Camedia C-4000 zoom with 4 megapixels. It takes perfectly fine pictures even though it’s “only” 4 megapixels. Actually the camera I had before that was a 3 megapixel camera and it took incredible pictures as well. They have always covered all my needs for digital photography, from pictures to put online for various reasons to large developed prints. They did everything I could expect from a digital camera, except for one thing: being handy when I was traveling or on the road. Even though I bought a camera belt bag, it was still a hassle to deal with and when I saw the new small size digital cameras on the market I was hooked. I needed to find a digital camera I could carry with me in my chest pocket. 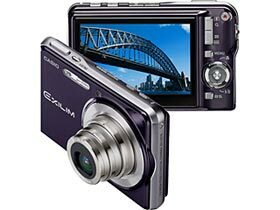 I went online reading reviews and checking prices and my choice came down to a very slim and elegant digital camera called Exilim EX-S770 from Casio. The camera is 7.2 megapixels, but as I mentioned before that really isn’t a big deal for me. My previous digital cameras with 3 or 4 megapixels did a perfect job. The camera comes in 3 colors: dark blue, red and silver. My choice was the dark blue (almost black). It has a silver edge all the way around and it gives it the touch of elegance. The camera is only 0.81 inch thick and the weight is 3.95oz. It got 3x optical zoom and 4 times digital zoom. It comes with a rechargeable battery and a dock to place the camera in when charging or transferring images to the computer. I was positively surprised when I first got the camera. I charged it and was able to start taking pictures right away without even reading the manual. The on screen menu is very easy to understand and use. I doubt I will need it much though. The cameras auto setting takes care of everything and delivers some very fine pictures. I added a 2gb memory card and the digital camera showed that it was ready to store over 900 pictures in auto mode. I found a added bonus that I hadn’t paid much attention to when I ordered the camera. The video function! The camera can be used as a camcorder and store the video in avi or mpeg4 format. I haven’t had time to look more into this yet, but using the video function on the camera out of the box, it records in avi format and in a quality at least as good as my older camcorder. Not only is it in a great quality, but it can take about 66 minutes per GB memory card, so with my 2gb memory I can shoot up to 2 hours and 12 minutes of video! Talk about value for the money, which brings me to the cost of this digital camera. Search around on the net and you will find it for $190. Usually digital cameras get down in price quickly so by the time you are reading this the price is probably even lower. The only annoying thing I have found so far is that the manual doesn’t come in print. You get it on a CD and it’s just my preference to have that kind of stuff on print so it’s easier to bring with me. But then again, this digital camera is so easy to use so I might never really need it anyway.